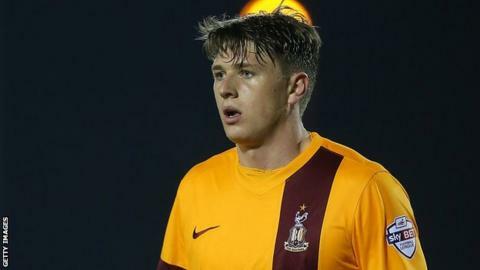 Adam Reach's free-kick proved to be the difference as Bradford beat League One play-off hopefuls Peterborough. The Bantams dominated early on, taking the lead through Reach's 25-yard free-kick into the top corner, before Posh had Shaun Brisley sent off for two bookings in two minutes. Posh improved after the break, with Britt Assombalonga twice striking wide. But Bradford held on and could have had a second through Kyle Bennett's header, which Day brilliantly saved. Jack Baldwin and Mark Little both saw late efforts for the visitors saved well by Jon McLaughlin. Despite the defeat, sixth-placed Peterborough remain four points clear of Swindon, while Bradford move up into 13th and take a step closer to securing their status in the third tier. Match ends, Bradford City 1, Peterborough United 0. Second Half ends, Bradford City 1, Peterborough United 0. Corner, Peterborough United. Conceded by Andrew Davies. Attempt saved. James Hanson (Bradford City) right footed shot from the centre of the box is saved in the bottom left corner. Hand ball by Jack Payne (Peterborough United). Attempt saved. Mark Little (Peterborough United) right footed shot from the right side of the box is saved in the bottom left corner. Attempt saved. Jack Baldwin (Peterborough United) right footed shot from the centre of the box is saved in the centre of the goal. Corner, Peterborough United. Conceded by Kyle Bennett. Foul by Aaron McLean (Bradford City). Attempt missed. Kyle Bennett (Bradford City) right footed shot from outside the box is too high. Craig Alcock (Peterborough United) wins a free kick on the left wing. Attempt saved. Kyle Bennett (Bradford City) header from the centre of the box is saved in the centre of the goal. Substitution, Peterborough United. Lloyd Isgrove replaces Conor Washington. Corner, Peterborough United. Conceded by Adam Drury. Adam Drury (Bradford City) is shown the yellow card. Foul by Adam Drury (Bradford City). Mark Little (Peterborough United) wins a free kick in the attacking half. Corner, Bradford City. Conceded by Joe Day. Attempt saved. Adam Reach (Bradford City) right footed shot from a difficult angle on the left is saved in the bottom left corner. Andrew Davies (Bradford City) wins a free kick in the attacking half. Substitution, Bradford City. Kyle Bennett replaces Raffaele De Vita. Substitution, Bradford City. Aaron McLean replaces Jon Stead. Attempt missed. Britt Assombalonga (Peterborough United) left footed shot from outside the box is close, but misses the top left corner. Britt Assombalonga (Peterborough United) wins a free kick in the defensive half. Attempt missed. Jack Payne (Peterborough United) right footed shot from the centre of the box is high and wide to the right. Attempt blocked. Britt Assombalonga (Peterborough United) right footed shot from the centre of the box is blocked.